The best, and longest, hike in Lincoln Brick County Park is this 2.2-mile walk that combines Beechnut, Cherry Ridge, Deer Run, and Tallman Trails. There is a little climbing towards the end of Deer Run but otherwise this is still an excellent outing for families with young children.With the many crossover trails it would be easy to shorten this hike if somebody gets unexpectedly tired. On county park maps and the trail signs at the parking area, Deer Run is shown as stopping at the junction with Heron Hollow. But the trail continues south of that to skirt the neck of land between the Grand River and Fraziers Pond. In fact this is the most interesting stretch of Deer Run. The best, and longest, hike in Lincoln Brick County Park is this 2.2-mile walk that combines Beechnut, Cherry Ridge, Deer Run, and Tallman Trails. There is a little climbing towards the end of Deer Run but otherwise this is still an excellent outing for families with young children. With the many crossover trails it would be easy to shorten this hike if somebody gets unexpectedly tired. On county park maps and the trail signs at the parking area, Deer Run is shown as stopping at the junction with Heron Hollow. But the trail continues south of that to skirt the neck of land between the Grand River and Fraziers Pond. In fact this is the most interesting stretch of Deer Run. Across the park road from the remains of the boiler room is the main trailhead and a map box. Head north (right) on Beechnut Trail. The path leads to a large footbridge over a ravine and then merges with Cherry Ridge Trail on the other side. Both trails put you on the edge of the bluff for an excellent overview of Michigan's longest river. At times you hike a small knoll topped with trees and covered, if it's autumn, with fallen leaves. Closer inspection will reveal that the knolls are actually piles of discarded bricks with reddish chunks still poking out from between the leaves. 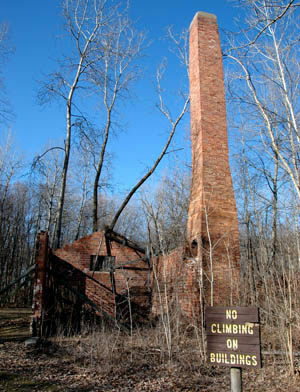 Other reminders from the park's brick-making days scattered along the trails include pieces of corrugated iron, a small brick-lined oven, even a mining cart that was used to carry shale up from the quarry. Within 0.5 mile from the trailhead, Cherry Ridge Trail descends to banks of the Grand River. 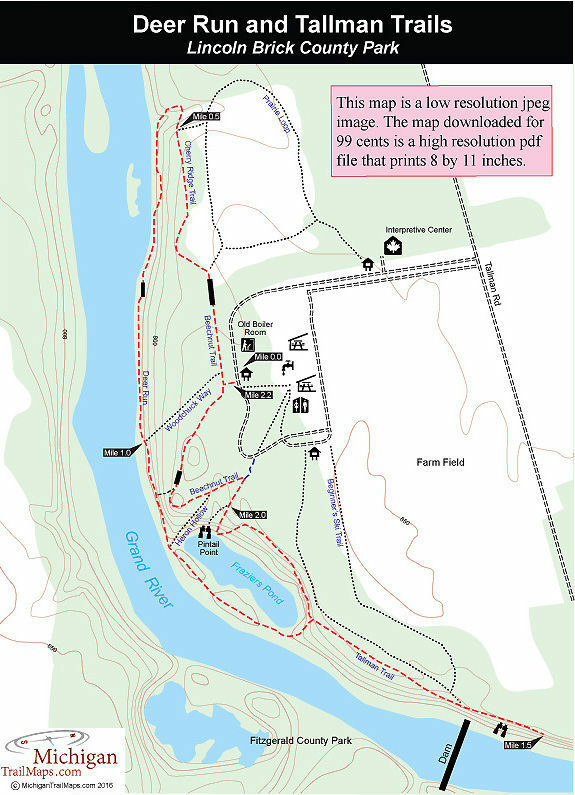 Here you head south (left) along Deer Run Trail and follow the river as you head downstream, at one point passing a small wooded island just off shore. Within 0.6 mile you reach Fraziers Pond. Legend has it that the brickmakers left a steam engine at the bottom of this quarry. Even if you can't see much in the murky water, the sandstone cliffs at the north end of the pond are almost as impressive as the famous Ledges in seen across the river in Fitzgerald County Park. At Mile 1.3 Deer Run swings east and makes a short but surprisingly steep climb to arrive at Tallman Trail. To the south (right) Tallman Trail skirts the Grand River for 0.25 mile, ending just beyond the dam that spans the river between Lincoln Brick Park and Fitzgerald Park, Eaton County's largest unit. In the spring and fall you can watch fishermen wading this stretch of the river and casting for steelhead trout. On the drawing board is to someday connect the two parks with a footbridge here that would allow hikers to continue to downtown Grand Ledge along the Ledges Trail. You backtrack north along the Tallman Trail, pass the junction with Deer Run. The trail dips to Fraziers Pond and then climbs an old two-track pass a viewing area above the cliffs called Pintail Point. Just before reaching the park road you can swing west (left) on Beechnut Trail and follow it back to the trailhead for more views of the Grand River below you. Lincoln Brick has two picnic pavilions in a pleasant wooded setting along with vault toilets and drinking water. Nearby there is a small playground. The park also has interpretive center with a museums and classroom available for rent. The small museum area features a display on the history of Lincoln Brick Park and has a large collection of fossils and rocks from all over the United States.